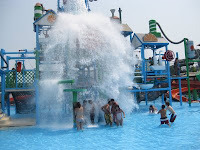 Quote of the blog: "Live the excitement & thrill on the biggest coolest splash on the island"
The Biggest, coolest splash on the Island. Winner - Europe's Leading Water-park Attraction. 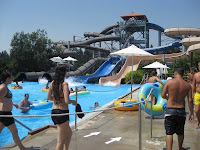 Fasouri Watermania features the largest selection of attractions and slides in Cyprus and beyond! Everything from breath taking Black Holes and Kamikaze Slide to a relaxing Lazy River… You can watch the slide-show of various snaps taken at the waterpark. We just got the tickets from our amdocs office with some rebate. We already postponed our plan 2-3 Sundays as per the availability of friends. Finally the day came, We wants to enjoy the full day, so the group (Vinay, Praveen, Saurabh, Mrunal including me) reached on-time there. We also purchased some snacks on the way itself, as We came to know that everything is much costly inside waterpark (yes, We are misers !!!). It was the day of amusement and learning for all of us. 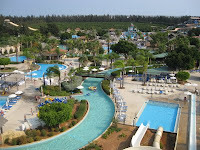 Equipped with the largest wavepool and lazy river in Cyprus our experience at Fasouri was not only guaranteed to be memorable for thrills, probowl experience where lifeguard saved us, but also for the sense of tranquility it offered us with its surrounding hectares of mature green and landscaped gardens. We assured you after probowl slide & black cannons where lifeguard saved us from drowning that, experienced lifeguards secure each and every ride offered at Fasouri. We learned the Water Lear, don't take the things lighter, whatever it is - Water or anything else. I got another life when I safely out of pool after probowl-slide. There is an interactive centre specifically for toddlers and you will find single-double-triple tube slides, wave pool, six lane mat race, wet bubble, free fall kamikaze, cross over lemon-pool and other slides & pools for amusement. We all did a slide for the daring one by one!!! "Free Fall Kamikaze". If you wanna to Gooooooooooo for this, take a deep sigh (get set), get anohter deep sigh (ready to Go)... and just release your body - Gooooooooo!!!! We showed we can do it. Can U? 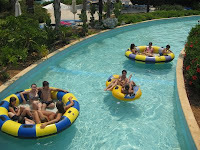 We enjoyed in lazy river around it approx 3-4 times and similarly in the wave pool. We just keep our eyes on wave-time, enjoyed the tide building up around us inside wave pool. You will get there free parking, lifejackets and sunbeds with umbrella. You have to pay for locker there. After too many steep plunges and breathtaking thrills, we feel hungry, so to fill our appetite we enjoyed our snacks & several food outlets there. 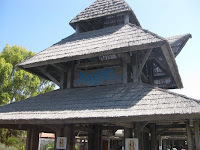 There is something for everyone there: Makai Pool Bar-Squeeze Juice Bar, Wiki Wiki Cafe, Pirates' Cove Fast Food Restaurant, Grill & Pasta House, Ice Cream Kiosk, Canal Restaurant. 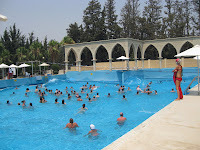 You can also get seasonal memberships with unlimited admission and various other benfits there. Shuttle Bus service available from Limassol and Paphos. No more miss call-miss call game!